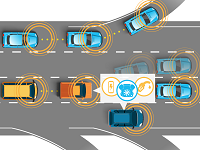 The University of Minnesota (UMN) will lead a team to develop technology to improve the fuel efficiency of delivery vehicles through real-time vehicle dynamic and powertrain control optimization using two-way vehicle-to-cloud (V2C) connectivity. The effort will lead to greater than 20% fuel economy improvement of a baseline 2016 E-GEN series hybrid delivery vehicle operating as part of the United Parcel Service (UPS) fleet. Large delivery vehicle fleet operators such as UPS currently use analytics to assign routes in such a way to minimize fuel consumption. Algorithms mine historical data collected from vehicles to determine routes before a driver leaves a distribution center. UPS has also invested in E-GEN series electric-powertrain vehicles that allow pure electric driving for extended periods of time and use a small range-extending gasoline engine-generator to charge the battery, allowing routes longer than 550 miles. However, the current UPS routing algorithms do not interact with the vehicle directly to improve the fuel economy in real-time. The UMN project will integrate the E-GEN vehicles with real-time powertrain optimization and two-way V2C connectivity. The vehicle's powertrain controller will be pre-programmed at the beginning of a route to optimize efficiency using historical data and known parameters like terrain, weather, and traffic. Powertrain calibration will be optimized and downloaded to the vehicle using V2C connectivity in real-time during a delivery route, compensating for parameter changes or unpredicted driver behavior. The team's technology may also be commercialized far quicker because UPS, in particular, already uses E-GEN vehicles. Large delivery fleet operators, more broadly, are also heavily invested in data collection for reducing fuel consumption and actively track their vehicles, both factors that could potentially accelerate deployment. If successful, developments made from the UMN project will enable at least an additional 20% reduction in energy consumption of future connected and automated delivery vehicles. Project innovations could lead to a dramatically more efficient domestic vehicle fleet, lessening U.S. dependence on imported oil. Project innovations would further solidify the United States' status as a global leader in connected and automated vehicle technology, while a more efficient vehicle fleet would reduce energy cost per mile driven and bolster economic competitiveness.